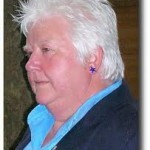 In recent years Val McDermid has become one of the most popular of the female crime writers. She progressed from Scottish journalist Lindsey Gordon whodunits to feisty red-headed Kate Brannigan crime investigations in Manchester, and then a third series, the profiler Dr Tony Hill. Her versatile repertoire includes historical mystery and she is an allround enthusiast for crime fiction as her reviews will confirm. This is the second Tony Hill novel, the title made famous by the television series. The creator of Dalziel & Pascoe and one of the great talents of modern crime Reginald Hill did the appreciation. Posted in Legends and Heroes, Psychological, Suspense, Women on the Case. Tagged as Dr Tony Hill, Reginald Hill, Val McDermid. In recent years Val McDermid has become one of the most popular of the female crime writers. She have published twenty-five novels and along the way has received many awards – notably, the CWA Gold Dagger for The Mermaid’s Singing (1995) and the Diamond Dagger for her body of work in 2010. What is interesting looking back is her development as a writer and how she pitches a book. Most crime and mystery writers start with a background and situations of experience which comes from what is familiar. Val began with a Scottish journalist narrator Lindsey Gordon, and stories that were contemporary whodunits. The whodunit was still pretty much the pre-eminent mode of detective/crime fiction back in 1987 when Report for Murder was issued. She moved up a gear or two with the feisty red-headed Kate Brannigan PI series based in Manchester. Val was now reaching for the readership that was formed around the “women on the case” sub-genre – the pattern was found in the characters such Anna Lee in Britain and Kinsey Millhone in the USA. Then came a move away from her previous work and a most courageous step. The Mermaid Singing introduced police profiler Dr Tony Hill and Val found a way to get below the surface of social reality by stepping into the area of which Ruth Rendell and Margaret Yorke had occupied with urban chillers – peopled with weidos underneath the surface of ordinary everyday folk. Val McDermid has also demonstrated how versatile she is with historical mysteries and we must not forget that she is an all round enthusiast for crime fiction as her reviews of others will confirm. This is the second Tony Hill novel, the title made famous by the television series. Plotline: Young girls are disappearing around the country. Everyone assumes they are teenage runaways, headed for the big city and bright lights. They vanish without trace — society’s disposable children, There is nothing to connect them to each other, let alone the killer whose charming manner hides a warped and sick mind. Nobody moves around inside the messy heads of serial killers like Dr Tony Hill. Now heading up the recently founded National Profiling Task Force, he sets his team an exercise: they are given the details of thirty missing teenagers and asked to use their new techniques to discover whether there is a sinister link between any of the cases. Only one officer comes up with a concrete theory, but it is ridiculed by the rest of her group … until a killer murders and mutilates one of their number. Could the outrageous suspicion possibly be true? For Tony Hill, the murder of a member of his team becomes a matter for personal revenge. Aided by his previous colleague, Carol Jordan, he embarks upon a campaign of psychological terrorism – a game of cat and mouse where the roles of hunter and hunted are all too easily reversed. 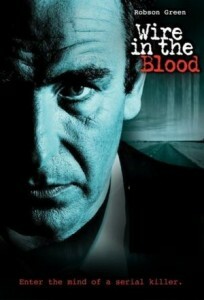 The Wire in the Blood is Val’s most famous book for it carries the weight of the highly successful television series with Robson Green and Hermione Norris. 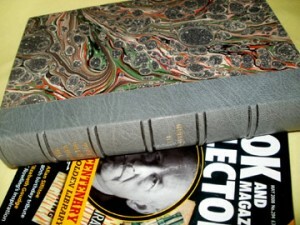 It was issued in an edition of 85 numbered and signed copies and a small number of presentation copies. The creator of Dalziel & Pascoe and one of the great talents of modern crime Reginald Hill did the appreciation for this edition. Val McDermid has herself written perceptive appreciations of Carol O’Connell, Julia Wallis Martin, Ruth Rendell and Karin Slaughter. She also had a short story in the anthology No Alibi. 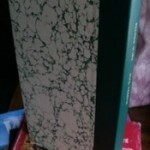 The featured image is of the deluxe presentation copy. If interested do let us know. There had, of course, been no doubt in my mind about the quality of Val McDermid’s creative talents . . , with her pacey plotting, sharp characterisation, quick-fire humour, incisive style, compulsive page-turnability, it’s always been clear that she is a natural born thriller writer. Fair seed-time had her creative soul, first in Fife where support for Raith Rovers must exercise all of a young artist’s creative muscle, then at Oxford where precocity has always been the mother of invention, and thence to a job in the parallel world of creative fiction known as journalism. Ten years ago her first crime novel, Report for Murder appeared and it was not long after this that she herself acknowledged what the critics were already asserting, that her star had found its true orbit, and it was time to come out as a full time novelist. Since then she has shone with an ever-growing effulgence in the criminous night sky. Her series of novels featuring Kate Brannigan, the Manchester based PI, has won golden opinions around the world and in 1995 she proved just how far she is from a one note singer with The Mermaids Singing, a chillingly original contribution to the modern serial killer genre which won her the Crime Writers’ Association Gold Dagger award for the best crime novel of the year. The volume you hold in your hand is the follow-up to this and in it she demonstrates that like the wise thrush she has no problem in recapturing that first fine careless rapture. So what next? Who knows? But anyone with a real interest in the progress of the British crime novel will dog her footsteps down the mean streets of Manchester, down the gloomy ginnels of the human psyche, . . . for like the good wine she already is and the great vintage she promises to be, Val McDermid travels well and her journey is just begun.